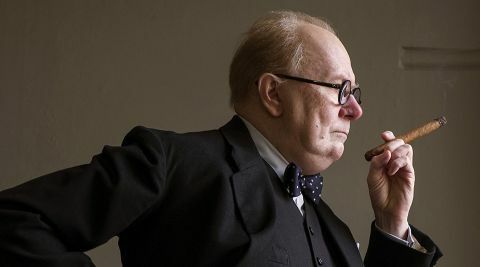 Darkest Hour review: "An Oscar-aimed turn from Gary Oldman anchors this WW2 portrait of Churchill"
Following recent turns by Brian Cox (Churchill), John Lithgow (The Crown), Michael Gambon (Churchill’s Secret) and Robert Hardy (Churchill: 100 Days That Saved Britain), the latest in a line of eminent thesps to tackle the sonorous role of Sir Winston is Gary Oldman. And a masterful job he makes of it, too. The stomping walk, the jutting lower lip, the rhetorical delivery with its studied pauses – all this, with the help of some not-too-obtrusive prosthetics, transforms him very convincingly into the iconic wartime leader. Not always so convincing are some of the things Joe Wright’s movie has Winston do. It all starts authentically enough: we’re in May 1940, the war’s going badly – disastrously – and beleaguered PM Neville Chamberlain (Ronald Pickup) realises he must stand down. Reluctantly, the cabinet decides that Churchill is the only man whom the opposition, and the country, will accept. Bolstered by his wife Clementine (Kristin Scott Thomas), he takes the job, but at once finds himself under pressure from all sides. Belgium and the Netherlands have fallen, the French army has been routed and the Brits have been pinned to a small enclave around Dunkirk. In the war cabinet, Churchill’s being urged – especially by Chamberlain and his ally Viscount Halifax (a vampiric Stephen Dillane) – to seek peace terms from Hitler. The Italian government is offering to mediate. Despite Clemmie encouraging him to stand firm, Churchill’s about to capitulate. But then he gets a visit from King George VI (Ben Mendelsohn) who tells him he should consult “the people”. So Winston – having never been on a bus in his life – trots down to his local Tube station, buys himself a ticket (with the help of a friendly woman) and boards a train. There he encounters a range of assorted citizens who exhort him with one voice to defy Adolf. Buoyed up, Winston heads back to the House, rallies his party… and the rest is speech-making history. We’re covering well-trodden ground, but the thunderous energy of Oldman’s performance, backed up by Wright’s sinewy camerawork, carries it through.